A truck carrying medical radioactive material has been stolen in Mexico, the UN's nuclear watchdog says. Mexico told the International Atomic Energy Agency (IAEA) that the truck was carrying a "dangerous radioactive source" used for cancer treatments when it was stolen on Monday. The radiotherapy source was being taken from a hospital in the northern city of Tijuana to a waste storage centre. It was stolen near the capital, Mexico City. 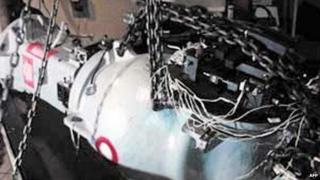 Mexico's Nuclear Security Commission said that at the time of the theft, the cobalt-60 teletherapy source was "properly shielded". But the commission warned it could be "extremely dangerous to a person if removed from the shielding, or if it was damaged". Local media reported that the truck, a 2.5-tonne Volkswagen Worker, was stolen by armed men at a petrol station in Tepojaco, on the outskirts of Mexico City on Monday morning. BBC world affairs correspondent Rajesh Mirchandani says Cobalt-60 could theoretically be used in a so-called "dirty bomb" - an explosive device that could spread radioactive material over a wide area - although there is no official suggestion this was the purpose of the theft. Mexican police are currently conducting a search for the truck and its contents and have issued a press release to alert the public to its potential dangers. Experts have long warned about the danger posed by radioactive material used for medical treatments and research in hospitals. The IAEA did not give details on how much radioactive material was in the vehicle when it was seized, but offered to assist Mexican authorities. "At the time the truck was stolen, the [radioactive] source was properly shielded. However, the source could be extremely dangerous to a person if removed from the shielding, or if it was damaged," the IAEA statement said. More than 100 incidents of thefts and other unauthorised activities involving nuclear and radioactive material are reported to the IAEA each year.